Are you looking for a body shop in Bergen County, NJ? 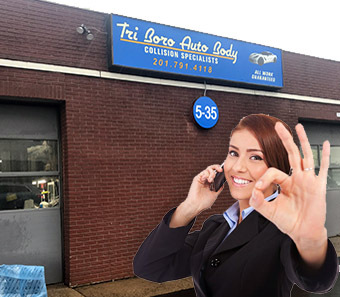 Tri-Boro Auto Body is a trusted and reliable body shop in Bergen County, NJ. For over 30 years, our skilled staff has restored accident-damaged vehicles to pre-accident conditions. Our auto body professionals have the training, experience, and expertise necessary to promptly get your car back on the road without indication that damage had ever occurred. We serve New Jersey drivers with expert service, affordable rates, and jobs completed without delay. When you require expert hands to restore your car's body, trust the professionals at Tri-Boro Auto Body. At Tri-Boro Auto Body, we specialize in collision repair that will remove all signs of an accident. No matter your car's make or model, we deliver expert service standards with body repairs, paint matching, frame straightening, auto refinishing services, and other auto body needs. We are dedicated to restoring automobiles to your satisfaction. When you hire Tri-Boro Auto Body, you ensure that your car is left in the hands of caring, expert professionals who understand how to promptly deliver the repairs your car needs to get you back on the road without delay. At our body shop, our professionals will return your vehicle with a showroom appearance. We stand behind all of our work with a lifetime guarantee. When you visit us for auto body repairs, we will erase signs of accident damage. From cars to light-duty trucks, we work hard to complete all repairs promptly while maintaining our high standards of quality. Because your satisfaction comes first, we work with your insurance company to help cover the costs of repair. Likewise, we work closely with local rental car agencies so that your daily routine is not affected while your car is repaired. Car accidents are highly stressful events. If your car or light-duty truck has received damage and requires experts to restore it to pre-accident, showroom conditions, trust a company that stands behind its work with lifetime guarantees, quality service, and timely repairs. At Tri-Boro Auto Body, your car is left in the hands of professionals with the skills and tools to handle all of your bodywork needs. For more information about our body shop in Bergen County, NJ, call Tri-Boro Auto Body at (201) 791-4118.